Darby Dan Farm is a legend of the bluegrass, in the same league as Calumet for sheer number of stakes winners, champion sires and blue hen mares. 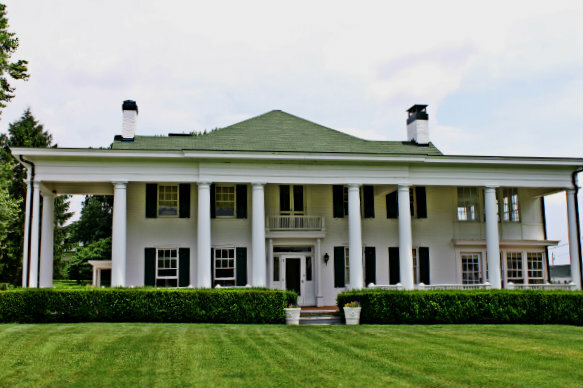 Originally founded as Idle Hour Stock Farm in 1906 by Col. E. R. Bradley, the farm was home to four Kentucky Derby winners in the 1920s and '30s. Col. Bradley was known for giving his horses names that started with the letter "B" - like Derby winners Bubbling Over, Burgoo King, Behave Yourself and Broker's Tip. Col. Bradley also imported European stallions and mares, adding valuable outcrosses to American bloodstock. This tradition continued in the 1950's, when the farm was purchased by John Galbreath. He renamed the farm Darby Dan and set out to make it his own in a big way. Galbreath brought the influential stallion Ribot to the US, and in 1972, Darby Dan homebred Roberto won the Epsom Derby in England. Under Galbreath's ownership, the farm bred two more Kentucky Derby winners as well, Proud Clarion and Chateaugay. The current master of Darby Dan is Galbreath's grandson, John Phillips. Under Phillips' management, the farm has thrived - fan favorite Winter Memories is just one of the stakes winners to carry the Darby Dan colors in the last decade. 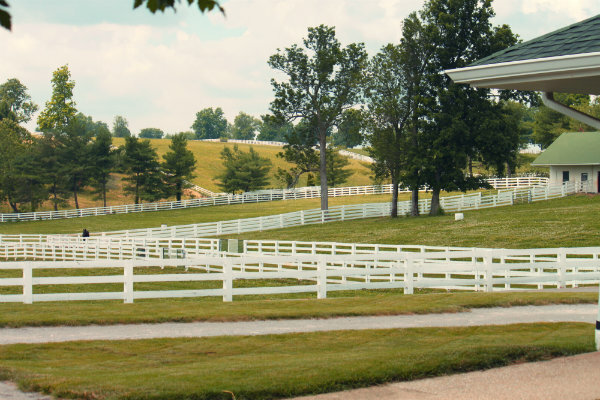 Movie buffs may recognize the farm's green-trimmed barns from the movie "Secretariat" -several of the scenes were shot there. Though Darby Dan has welcomed visitors to its stallion barn for many years, the new tour includes two rooms in the stately mansion, built in 1828. 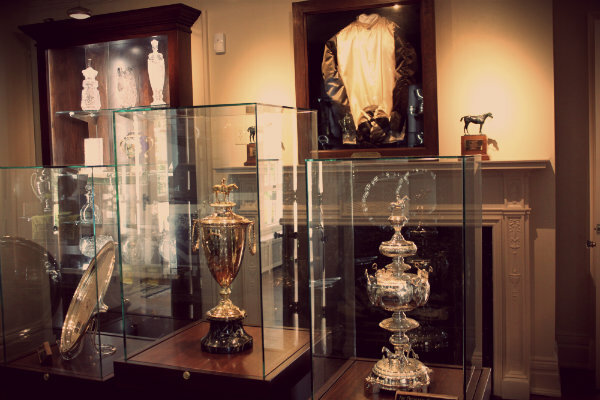 Racing fans will get to see the aforementioned six trophies, plus many more, in the newly-constructed trophy room. The trophy room's design was based on old photographs recently discovered of the one used by Col. Bradley. Next to the trophy room is Col. Bradley's office. An antique desk and chairs furnish the space that is highlighted by picture windows offering a panoramic view of the rolling Kentucky countryside. One can almost envision the Colonel himself gazing out at his estate from this room. You can experience Darby Dan Farm yourself, Tuesdays through Saturdays. Admission is $10. Contact Tracie Willis, tracie@darbydan.com, to schedule your tour. Fans of the farm and its horses can find quality Darby Dan merchandise at its new online store - shop now! Now about that World Series trophy - John Galbreath was quite the sportsman, and as well as owning one of the top thoroughbred farms in history, he was the owner of the Pittsburgh Pirates! The Pirates won 3 World Series titles, in 1960, 71 and 79. In fact, the Epsom Derby winner, Roberto, was named after Pirates player Roberto Clemente. The three World Series rings, as well as Clemente's last baseball bat, are also on display in the trophy room. Candice absolutely gorgeous landscape. I will be going to Keeneland this Fall and i will be visiting Darby Dan. Just one question.Did you get to see one of my favorites>>Wonder Again. She was an amazing and under rated turffer. She knocked heads with the very best. I went to WinStar and saw Tiznow. After seeing how gorgeous it is,i can see why. It is also the one farm i can relate to from a personal perspective. I saw many of their Mares grow up and become stars. If i can get my hands on a Camera,i'll take pictures . Looking forward to seeing Keeneland. Will be more of a buisiness trip,but will definately get to the track. Shackleford is not looking impressed with all the hoopla..lol. Jay. Sent you an email. Just reply so I know I have it right. Thanks. BP, same acct name but now @yahoo.com. Veitch was there in the 1980's at Darby Dan, I think after his stint at Calumet and I think Lou was before Veitch because he trained Little Current in the 1970's. Tom. I know Conway trained Chateaugay and Lloyd Gentry trained Proud Clarion. I would say they had a lot of nice dirt horses. Of course their European stable was all turf horses. Buck before Veitch,was it Rondinello that trained Darby Dan horses. Except for a few,they were known for their turfers. Tom. It is a beautiful farm. The bulk of Bradley's Farm is now Darby Dan, but there were two other parcels, one became Danada Farm owned by Ada L. Rice, the other became King Ranch. Col. Bradley owned over 1,000 acres, which I believe was on both sides of the road. I am looking forward to it Buck. This will be the only Farm i will have time to visit. As I understand it, Idle Hour Stock Farm owned by E.R. Bradley and now of course Darby Dan Farm was actually surveyed by Daniel Boone for the original owners from whom the Colonel purchased it. Thanks for the farm video; I do believe that was Shack featured in his stall! 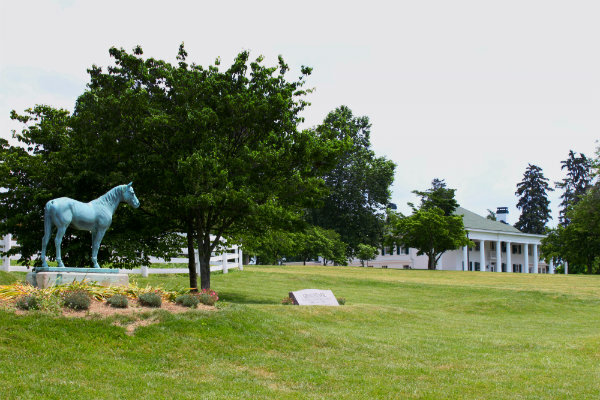 I hope you enjoy this peek into Darby Dan Farm - it was a very nice tour and I hope you can visit someday!